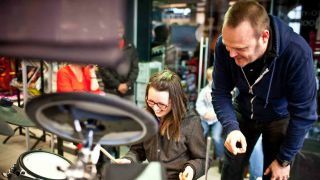 Cast members from the multi award-winning musical Once and comedian Al Murray will be giving free music lessons at Yamaha Music London in Wardour Street on Saturday 12th April to kickstart the National Learn to Play Day 2014. Organised by Music for All, the charity of the UK musical instrument industry, the day is designed to welcome people into music shops around the country and to inspire them to get playing. People are often surprised to discover that they ARE musical and simply need a musical experience to get them inspired to start playing. It's estimated that 15 million people in the UK either want to play an instrument or used to play one. Yamaha Music London is an official instrument partner for Once. The musical was a huge hit on Broadway, scooping 8 Tony Awards including Best New Musical in 2012 and continues to wow audiences since opening at London's Phoenix Theatre, where its multi-instrumental cast of super talented actors and musicians all sing and play live on stage. All Murray, Britain's most famous and favourite Pub Landlord, who also happens to be a dynamo on the Drum Kit, returns for a third year to Yamaha Music London following his previously successful and highly popular visits for the campaign.The man himself is clearly looking forward to returning to Yamaha Music London and says of last year's visit; "It was brilliant! All these people who dreamed of being the next Phil Collins or Nick Mason had a go and many of them enjoyed it so much they went away confident that they would carry on drumming." Cast members from Once and Al Murray will be in-store from 11am until midday to welcome music makers and offer free guitar and drum lessons. Visitors can watch or take part in the sessions or lessons in Piano, Guitar/Ukulele, Electronic Drums and Violin. Yamaha Music London tutors and experienced staff will be on hand between 11am and 5pm to help customers try instruments and get started with a host of special offers. Nigel Hill, Store Manager at Yamaha Music London said "We are delighted to welcome the cast of Once and Al Murray to Yamaha Music London. This is a great initiative to introduce people to the fun they can have making music and what could be more inspiring and fun than to meet and have your first music lesson with the cast of a West End Show and Al Murray! We look forward to welcoming visitors to Yamaha Music London on Saturday 12th April and helping them take their first musical steps." Paul McManus, Chief Executive of Music For All comments, "We are delighted and proud to have so many talented musicians supporting our event and the public will clearly be able to have an amazing time at Yamaha Music London!" The musical Once tells the story of an Irish busker and a Czech girl who meet through a shared love of music. Their song writing sparks a deep connection and a tender, longing romance that neither of them could have expected. The National Learn to Play Day is organised by the charity Music for All in partnership with the Musicians' Union, Arts Council England's Take it away scheme, MusicTeachers.co.uk and MusicRadar.com.